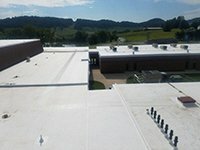 Single-ply roofing is the fastest growing segment of the commercial roofing industry and provides exceptional resistance to ultraviolet radiation. TPO’s head welded seams are extremely efficient, resulting in the low occurrence of seam failures. TPO is relatively lightweight, however, it does not offer much strength in standing up to abuse. TPO material can be fully adhered, mechanically fastened, or ballasted. Synthetic rubber systems have been the industry leader for nearly half a century and it extremely resistant to weathering due to its ability to withstand low temperatures and the absorption of moisture. The most popular EPDM membrane is black, however, it is also available in white. White EPDM offers more reflectance to UVA and infrared rays but does not provide the resistance to weathering as the black membrane does. The seams are either a liquid applied adhesive or a tape, which is dependent on the skills of the installer. EPDM material can be fully adhered, mechanically fastened, or ballasted. Membrane roofing is one of the oldest in the industry. The membrane has a broad range or fire ratings and provides exceptional resistance to harsh chemicals and pollutants. PVC can be fully adhered or mechanically fastened; however, ballasted is not recommended due to the rocks and dust leaching plasticizers from the membrane. Due to the plasticizers, a separator sheet is needed between any asphalt, coal tar products, or polystyrene insulation. Roof membrane is composed of alternating layers of bitumen and reinforcing fabrics. The bitumen typically used in BUR roof systems is asphalt, coal tar or cold-applied adhesive. The asphalt or coal tar is heated in a kettle and then applied by mop or mechanical spreader. Exposed asphalt is susceptible to weathering so a cap sheet or coating is applied If coating is used, it must be reapplied over time. Roofs are composed of multiple layers similar to BUR membranes. MB roof systems are usually installed as a two-ply system and fully adhered. MB roofs are durable and can handle abuse. There are three types of MB sheets, which include APP (aresistant to high-temperature flow), SBS (withstands low temperatures), and SIS (rarely used self adhering sheets with low UV resistance). Roof panels are usually installed on steep sloped roofs that can shed water quickly due to its seams not being weather tight. There are two types of metal roofs; flat seam architectural panel (extremely labor intensive and expensive) and standing seam (raised joints above the water line that are either sealed mechanically, with sealant or tape). Metal roof coatings resist corrosion and provide a long-term solution that is relatively maintenance free. Shingles are the most common and lease expensive option. They are installed on sloped roofs and are available in fiberglass (better fire resistance) or organic reinforcement. There are two design styles; three tab or architectural (dimensional/longer warranty duration). Coatings can increase the life expectancy of most roof systems. There are three main types of coatings; acrylic (least expensive), silicone (longer life expectancy but prone to birds pecking), and polyurethane (durable with a longer life expectancy). Before a roof can be coated, all necessary repairs must be made to the existing roof system using the corresponding material, all seams must be covered, and any areas of ponding water need to be addressed (will deteriorate coating). Roofs with over 30% saturated insulation cannot be coated because of the risk of mold.